i’m so happy to see that Neighbours passed the million mark again. 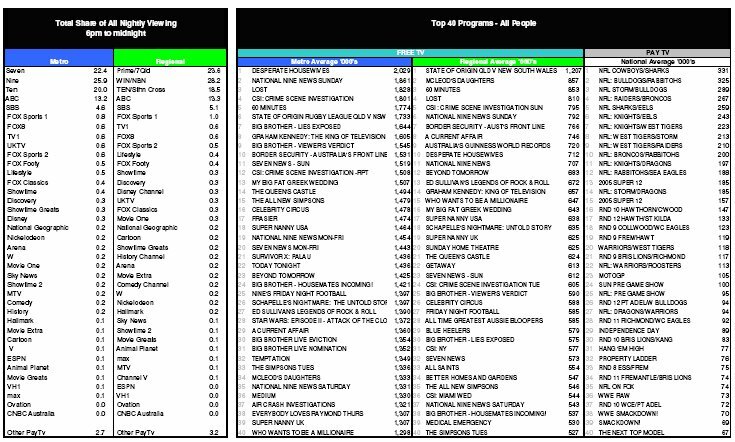 Hopefully the ratings will continue to rise and one day it may be able to beat that horrible Home and Away. The radio stations were reporting a 1.9m figure for BB last night – is the 1.7m an average? The astronomically high figures for Torchwood would suggest that its ratings figure was taken while BB was still on, because I can’t see that many people watching it! Nothing rates that well at 10pm! Hi David..How did Rove and Hamish and Andy rate?